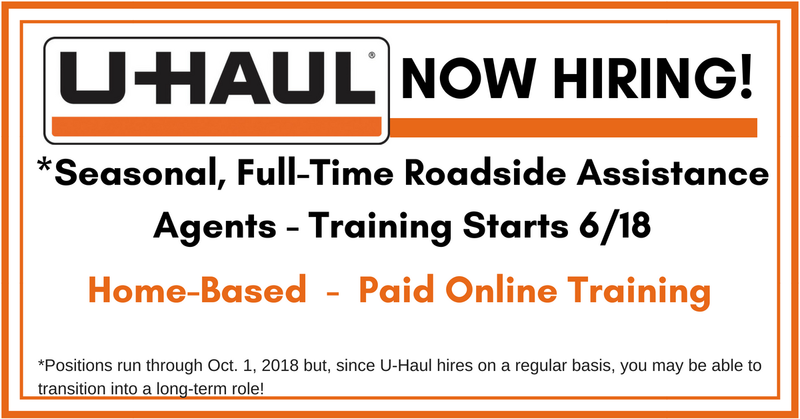 U-Haul is Hiring Across the US! If you’ve been reading our “I got hired” posts, you know that dozens of RRRebels have already landed jobs with U-haul and are loving it! Now is your chance to get on with the company too! U-Haul is currently hiring SEASONAL, FULL-TIME Roadside Assistance Agents. These jobs will run through October 1, 2018. That said, the company hires on a regular basis so this is a great way to prove you’ve got the right stuff and you may just be asked to stay on after October. The company hires from across the US but, since they are based in Arizona, all hours noted are AZ time zone. “Enjoy working from the comfort of your own home office! Internet requirements: Broadband/high speed internet with at least 2MB upload and 5MB download with a ping below 70. 5MB upload and 10MB download is preferred for a better experience. Click here for full details and to apply. For more jobs like these, be sure to check our Newest Jobs & Gigs page. To get our job postings ASAP, like our Facebook page and check your feed for our posts. May you be working from home soon!